Al Capone. He ruled Chicago with absolute power. No one could touch him. No one could stop him ... until Eliot Ness and a small force of men swore they'd bring him down. The critics and public agree. Brian DePalma's The Untouchables is a must see masterpiece - a glorious, fierce, larger-than-life depiction of the mob warlord who ruled Prohibition-era Chicago ... and the law enforcer who vowed to bring him down. This classic confrontation between good and evil stars Kevin Costner as federal agent Eliot Ness, Robert DeNiro as gangland kingpin Al Capone and Sean Connery as Malone, the cop who teaches Ness how to beat the mob: shoot fast and shoot first. Some movies don’t get much respect during their initial runs but they gain favor as the years pass. Into this category falls Brian De Palma’s The Untouchables. 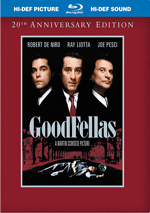 As I recall, the movie received pretty mixed reviews when it hit theaters in 1987, but since that time, it seems to have become regarded as a minor classic of the crime/gangster genre. I won’t quibble with that interpretation. Although The Untouchables falters at times, mainly due to a rather slow start, the movie provides a mostly provocative and exciting experience. It’s not quite a great film, but it usually works very well. Based on the factual efforts of federal agent Eliot Ness (Kevin Costner), the story focuses on his efforts to nab infamous crime boss Al Capone (Robert De Niro). In extremely corrupt Prohibition-era Chicago, Ness builds a team of “Untouchables”: fellow agents who resist the temptations of bribes and who can’t be bought. Ness adds three teammates: grizzled cop Jim Malone (Sean Connery), nerdy accountant Oscar Wallace (Charles Martin Smith), and hotheaded sharpshooter George Stone (Andy Garcia). With this group in tow, Ness starts to clean up the town. Capone remains his white whale, however, and Ness, et al, spend most of the film in pursuit of him. For the most part, Untouchables offers a fairly standard gangster flick, but it’s made special due to the talents of its actors. Actually, that should be made more specific: I liked the film largely because of the supporting cast. Costner is fine as Ness, and he adds a genuine quality to the role that works, but he doesn’t provide much spark in this rather straight-laced role. De Niro is also good as Capone, but he doesn’t have to reach too far into his bag of tricks for the part. Connery won his first - and only - Oscar for his work here. While I think this award was essentially a cumulative prize for his terrific career, I can’t deny that Connery provides solid work in Untouchables, and the film returns the favor. After a fairly long series of mostly-forgettable films, Untouchables sparked a career renaissance for Connery. Frankly, the movie seems somewhat dull and drab until Connery enters. From that point on, however, it becomes much more exciting and compelling; Connery’s presence really helps bring the picture to life, and the fine talents of Smith and Garcia also maintain this more spry and involving atmosphere. Not that they work in a vacuum, of course, as Untouchables marks one of De Palma’s better efforts. I’ve occasionally cracked on De Palma because of his extremely spotty track record. As with John Carpenter, De Palma maintains a positive reputation even though most of his films have been dogs, and flea-bitten ones at that. However, I will give credit where it’s due, and De Palma manages to maintain a good pace throughout Untouchables. He especially excels during some of the action scenes. One of the film’s most famous segments takes place in a train station and involves a pram; it’s a truly memorable and tense piece. Also terrific is the shoot-out on the Canadian border; De Palma takes some fairly standard material and made it quite crisp and exciting. Actually, one of my favorite aspects of Untouchables stems from its attitude toward violence. I like the fact that we find a protagonist in Ness who understands the implications of physical attacks and who tries hard to avoid the use of weapons. Too many movies treat the subject in a cavalier manner, and Untouchables has some of those moments as well. However, it largely uses violence in a powerful manner that made its repercussions more clearly felt; when a main character dies, the impact seems much stronger than usual. The Untouchables has its flaws, but as a whole, I find the film to offer a dramatic and compelling experience. Inconsistent director Brian De Palma manages to provide strong guidance on this occasion, and the terrific cast lets the movie reach a higher level. For an action-oriented gangster flick, you can’t do too much better than this. 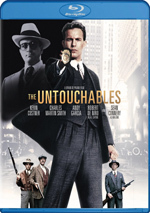 The Untouchables appears in an aspect ratio of approximately 2.35:1 on this Blu-ray Disc. This was a more than watchable presentation but not one that was as natural as it could have been. Sharpness appeared crisp and tight throughout most of the film, with virtually no signs of soft or hazy images. A little edge enhancement seemed apparent, though, and I got the sense that the movie came with digital noise reduction; this gave the image a somewhat dense, clay-like feel at times. It also meant that the presentation looked “processed” and not especially film-like much of the time. Print flaws were essentially absent. Colors looked fairly rich and natural. Untouchables favored a warm and glowing palette, and the disc reproduced these hues reasonably well, though the noise reduction could make them a bit flat. Black levels were deep and dark, and contrast seemed strong. Shadows lacked any problems related to excessive heaviness or murkiness. This was always a decent presentation, but the digital processing left it as a “B-“. The disc provided both Dolby Digital EX 5.1 and DTS 6.1 soundtracks. I’d be hard-pressed to find differences; the DTS mix was a bit louder, but otherwise, the pair sounded a lot alike. The soundfields remained largely anchored to the forward channels. Across the front spectrum, I thought the audio appeared somewhat too “speaker specific” for parts of the track. For example, when a card game took place on the left hand side of the screen, the shuffling of the cards seemed too loud and prominent, and was artificial. However, much of the sound blended together nicely and also panned well. Music offered solid stereo separation. Surround usage appeared fairly minor. I detected some minor ambiance at times, and a few gunfight scenes added useful atmosphere. Audio quality also seemed erratic but relatively good. Dialogue had the most variation. Most of the speech came across as clear and acceptably natural, but some lines could be flat and dull. For some reason, that tendency was most prevalent during Connery’s scenes. Effects appeared reasonably crisp and realistic, though some distortion could crop up at times; not surprising, gunfights and explosions presented the biggest problems in this domain. Easily the best aspect of the soundtrack stemmed from the reproduction of Ennio Morricone’s excellent score. The music always sounded clean and full, with some nice low-end and clear highs. As a whole, the soundtrack of The Untouchables was something of a mixed bag, but it worked reasonably well for a film of its vintage. 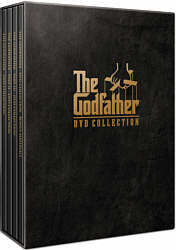 How did the Blu-ray compare with the Special Collector’s Edition DVD from 2004? The DD 5.1 track was identical to the one on the DVD, but the Blu-ray added the DTS mix. That made it different but not better; it’s too bad we didn’t find a lossless option here. Visuals were tighter, cleaner and better defined; while the processing made this a less than ideal transfer, it still bettered the DVD. The Blu-ray replicates the 2004 DVD’s extras. Other than the film’s trailer, all of the supplements come from featurettes. The Script, The Cast runs for 18 minutes and 32 seconds and includes notes from director Brian De Palma, producer Art Linson, and actors Kevin Costner, Charles Martin Smith, Andy Garcia, and Sean Connery. They discuss how De Palma ended up on the project, some general notes about its development, casting and the characters, and the interaction on the set. It comes as a disappointment that none of the actors appear in modern interviews; all of their clips came from the set and frankly, they don’t tell us much. However, the new comments from De Palma and Linson prove valuable, especially when they chat about the struggle to land De Niro. It’s an inconsistent featurette but it includes more than a few good tidbits. Next we find 17 minutes and 19 seconds of Production Stories. It provides notes from De Palma, Connery, Smith, Costner, director of photography Stephen H. Burum, and visual consultant Patrizia Von Brandenstein. We learn about decisions related to the movie’s visual style, locations, production design and vintage elements, clothes, character issues, and some scene specifics. Another mix of old and new interviews, this one seems more satisfying than “Script”. It jumps from one topic to another without great logic, but it gets into many useful subjects and explores them moderately well. In Reinventing the Genre, we get a 14-minute and 24-second piece. It offers statements from De Palma, Smith, Costner, Burnum, and Linson. 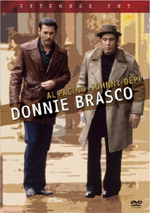 They get into ways they attempted to expand the gangster genre such as the horseback scene, some character death sequences, the train station, the score, Billy Drago’s turn as Frank Nitti, and an alternate ending concept. We hear some notes about the actors’ issues for the various pieces, changes that popped up along the way, and technical concerns like Steadicam shots. As with “Stories”, it doesn’t flow terribly well, but a lot of good information pops up to make this an entertaining and intriguing piece. For the final new featurette, we discover The Classic. It goes for five minutes, 41 seconds and presents remarks from De Palma, Burnum, Smith, and Linson. They cover their initial reactions to the completed movie, its score, and public success. It doesn’t tell us much other than that people liked the flick, so don’t expect much from this piece. Lastly, we locate an Original Featurette subtitled “The Men”. From the period of the movie’s initial release, it takes five minutes, 26 seconds and presents notes from Costner, Connery, Garcia, and Smith. It mainly concentrates on general story and character explanations and tells us very little about the movie’s creation. It’s a promotional piece and little more. The Untouchables doesn’t always fire on all cylinders, but it provides a generally exciting and well-executed affair. The Blu-ray provides generally good picture, audio and bonus materials, though the visuals lack the “film-like” appearance I’d expect. Still, this is the best version of the film I’ve seen on home video, even if it could/should be better.